I warned you this blog was going to feature too much Star Trek, right? I also said I’d be blathering on (at length) about roleplaying games. But this is the NerdVerse, so of course there has to be a topic that allows me to combine them. And now there is! If you’re unfamiliar with roleplaying games, count yourself lucky – because you just discovered one of life’s greatest joys. Roleplaying games are a unique form of collaborative, improvised storytelling. Traditionally it meant a bunch of friends sitting around a table with books, handouts, and odd-looking dice. One of you would set the scene and describe events, then everyone else would take turns telling each other what their characters did in response. It’s a fantastic way to spend several hours and I cannot recommend it enough. If you’ve never played an RPG, the whole idea may strike you as odd. But it’s one of my favourite things to do with friends. You end up learning a lot about each other – and not just how good your friends are at doing maths. So what does any of this have to do with Star Trek? Perhaps the idea sounds intruiging, but you aren’t sure about RPGs. Or you may be familiar with RPGs but don’t want to spend money or time to read another set of rulebooks. If so, you’re in luck! 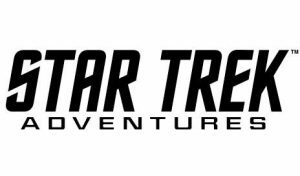 Over at Geek & Sundry, a group has been running a Star Trek Adventures game, with episodes broadcast live and posted online. So if you have a few hours to spare and you enjoy watching talented people do amazing things, check out SHIELD OF TOMORROW. It’s run by the underrated Eric Campbell, and it stars a marvellous diverse cast. It is a joy to watch. You can even watch live. But if you’re in South Africa, you’ll need to get up pretty early and you’ll need the day off, because it starts at 06:30 Thursday, South African time. (That’s 21:30 Wednesday, in Pacific Time (PDT).) You can also follow the show on twitter, @shieldoftmrw, and read more about it on the Geek & Sundry website. Modiphius is also famous for RPG systems like Achtung! Cthulhu; Conan: Adventures in an Age Undreamed Of; Coriolis – The Third Horizon; Mutant Chronicles; and more. You may want to check out those, too. (DriveThruRPG hosts plenty of free trial content, which is worth a look.) Click the company logos in this post to go to the relevant pages. I suspect you’ll hear plenty more about the Shield of Tomorrow here, too.